For decades even centuries business cards have been an indispensable tool for business people to share their contact information. As printing techniques have evolved in more recent years, the quality and variety of business cards available has allowed the business card to become not just a means of sharing business contact details but also a unique marketing tool to help you stand out from your competitors. In today’s fast moving competitive world first impressions are more important than ever before. You may not think that something as small and seemingly insignificant as a business card would make a difference to your chances of winning new business but they really do. How many times have you been handed a business card in the past? Did any of those cards stand out to you as being different, either in the quality of the design or quality of material? As a business owner I’ve been handed many business cards throughout the years and I’ve often found myself making judgements about a business based on the quality of the card I’ve been handed, why? Personally I feel the little things count. If someone has put that little extra time into the design and quality of something as simple as a business card, this gives me confidence that the same attention to detail will be given to the quality of the product or service that the business has to offer. When creating a business card for your company one of the hardest things to decide is what to put on it. Most people will at least want to display their contact details and business logo but after that the possibilities are endless. How far you want to go with the creativity of your business card will often depend on the type of business you’re in and the impression you want to give to potential clients. Personally I prefer to keep things simple giving extra attention to the quality of material used but I understand that some businesses will want to take a more creative approach. A design based business for example may want to show off their creative skills on their business card. Some of the cards I’ve been handed in the past have contained nothing more than a company logo and a web address. I have to admit these simplistic and artistic cards have raised my level of intrigue, making me wonder just who the company are and what they have to offer. Whether most people have the time to do the research though is another story. Although it adds expense, spending that little extra money to improve the quality of the material your card is printed on may well pay dividends in the long run. Personally I’m unimpressed when I’m handed a thin flimsy business card with a poor print quality. Not only do they not impress me but I’ve also found that they tend to get damaged or soiled quite easily. It’s worth paying that little extra to have your design printed onto a high quality material. If you want to give your business card a little more of a ‘wow factor’ there are many options you can consider. Almost all online printers will offer you the option to print a double sided card; you might also want to consider adding a glossy finish. If you want to take things a step further many printers offer printed plastic cards or even metallic cards. 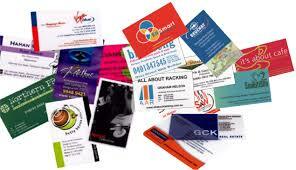 An impressive business card will help people to remember your brand and also to value your product or service. In our fast moving competitive world people make judgements very quickly so first impressions count. Be sure that the design and quality of your business cards accurately reflect the quality of your business offering. 7 Responses to What Does Your Business Card Say About Your Business? Glad to see that I am not the only one who makes that judgment. The business card is not the end all be all in my opinion but can be a great way to see possibly how serious you can take the individual. I was a graphic designer for a long time back in my early career. I am a bit of a snob when it comes to business cards, and the one tip I didn’t see here is to have it professionally designed. With the emergence of vistaprint.com (in the US) and other inexpensive printing sites, there are so many poorly-designed, obviously “home-made” cards out there! There are many design professionals at all levels of price. You get what you pay for, but if you truly can’t afford a full-prices designer, look at art schools, put an ad on Craigslist, find a way to have someone design a professional logo and a professional card. If you can’t afford to do a good job for yourself, how are you going to do a good job for your (potential) clients? I’d agree with that, it’s a small price to pay for something that will represent your business for years to come. I enjoy grabbing a business card from someone when I need one and am happy to keep them on hand. I’m not too worried about how posh it is just as long as it tells me what I need to know. I can’t tell you how many times they have helped me in my personal life and with my career. I do like a nice quality business card myself, they don’t need to be too fancy but I feel they say something about the business. I prefer the simplistic approach. It still has to have an impact but glaring colors and goofy picture don’t do anything to promote your business (In my opinion at least). Yeah me too Jose, simple and sleak.